The LNWR had a strong links with Ireland, handling mail, passenger and freight traffic. The Stalbridge Dock, opened in 1909, provided the Company with its own facilities for handling freight, particularly coal, timber, minerals and bananas. 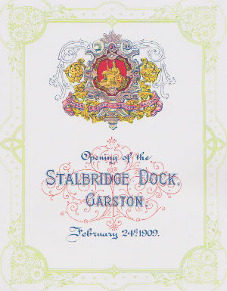 This joint publication combines a reprint of the LNWR Souvenir Brochure for the opening of the Stalbridge Dock, Garston and a new Portfolio by Mike Fell, describing the docks operation and traffic. The Portfolio includes many informative and detailed photos, complementing those in the Brochure. The banana traffic receives particular attention and includes interesting details of the vans manufactured by the LNWR to handle this traffic. Together they provide an interesting insight into freight traffic and handling, and the importance of the relationship between rail and sea transportation. The Souvenir Brochure has 20 pages with 11 plates, the Portfolio 30 pages with 27 plates, 3 maps and 2 detailed drawings. Both are card bound and presented together in a card slip case.